Connect your loan calculator directly to your working papers in CaseWare. The Loan / Lease Calculator increases the functionality of the long-term debt, callable debt, and capital lease working papers. Calculated amounts are entered into the working paper at the push of a button eliminating the need to re-enter data. This feature received a major update in late April significantly increasing its functionality. It now includes support for Canadian mortgage calculations. The Loan / Lease Calculator can be accessed directly from any of the above mentioned working papers by double clicking on its Loan ID. Alternatively, it can be accessed by right-clicking the Express Button. When accessed in this manner, the loan details are automatically filled into the calculator. Options for amortization method, payment intervals and compounding intervals are available. 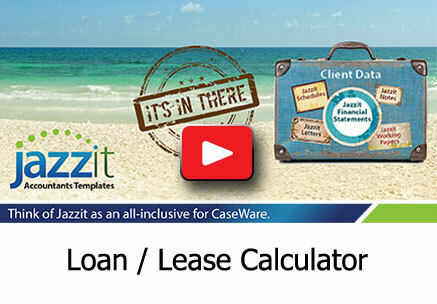 The Loan / Lease Calculator can use the payment amount as entered on the working paper for its calculations OR can calculate the payment amount on its own. 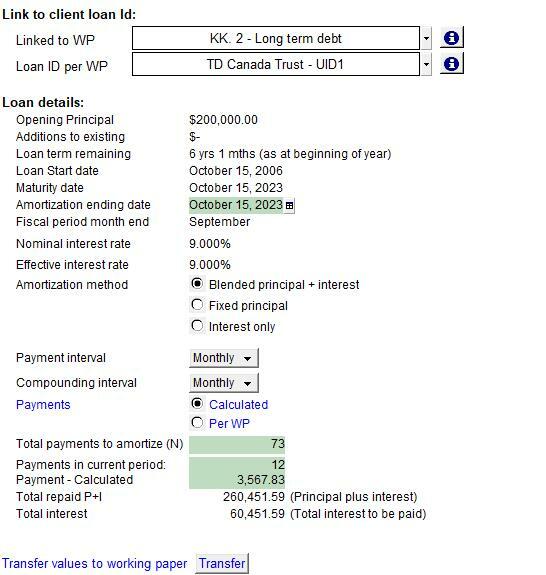 Payment, principal and interest information is calculated and displayed in the Loan / Lease Calculator. Changes to options and payment information can be made as required. Payments for individual periods can also be modified. These changes are automatically reflected in the calculation. Once the information as calculated is approved by the preparer, it can be transferred back to the working paper by clicking on the transfer button. Another feature is the ability to specify the loan balance at the end of the fiscal period for the purposes of calculating future repayments. This is particularly useful in prime + loan situations.